The race heads into the mountains and the Sierra de Cazorla range but as lively as the profile looks this is merely a warm-up for the upcoming stages. It’s a day for the likes of Alejandro Valverde but can Peter Sagan track him again? 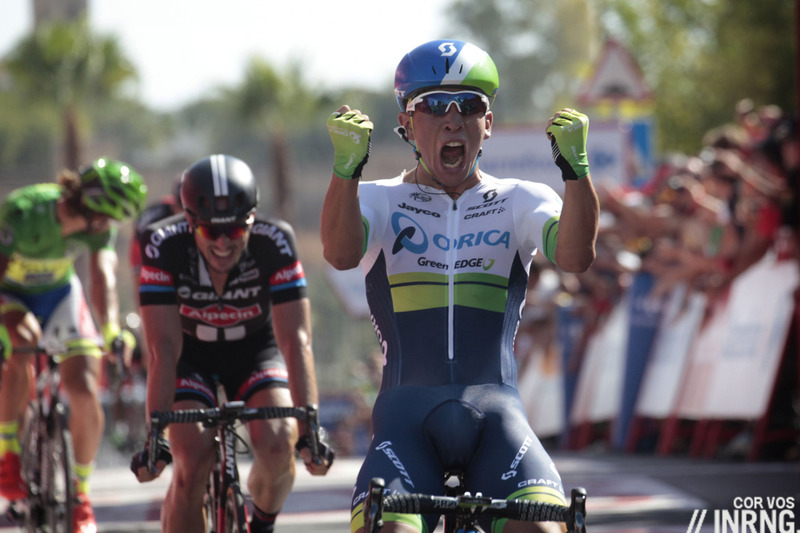 Stage 5 Wrap: a win for Caleb Ewan, his first of many and the manner of the win shows why. He was clearly the fastest sprinter and won on an uphill slope that was a test of power rather than luck. Sometimes it’s possible to come off the right wheel at the right time and snipe a win but this wasn’t one of those lucky days. Orica-Greenedge and Giant-Alpecin had opposing days, Ewan beat John Degenkolb but Tom Dumoulin took the red jersey off Esteban Chaves after the Dutchman kept the right side of a split in the peloton. The Australian team are mirroring their magic start to the Giro. It’s still a wonder why they’re Orica-YourNameHere given their success rate in high profile races. 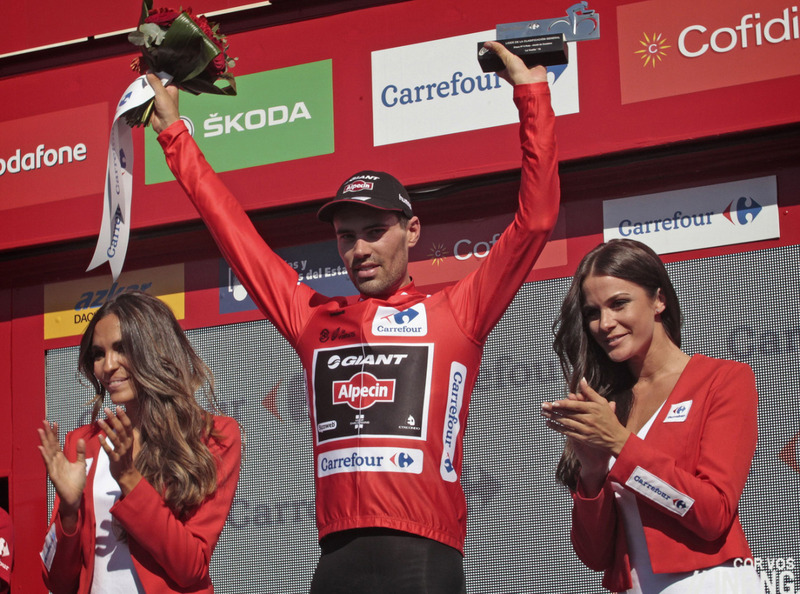 As for Dumoulin, a nice reward but it’ll be hard to hold for long with the likes of Alejandro Valverde hovering. The Route: 200km and into the mountains. The Alto de Baeza is 11.8km long at a gentle 3.8% and regular too, the slope doesn’t ever go beyond 5%. After the town of Torreperogil the road drops down to the valley and the rises again but for all the y-axis action on the profile it’s a 3% slope most of the time, a gentle rise. 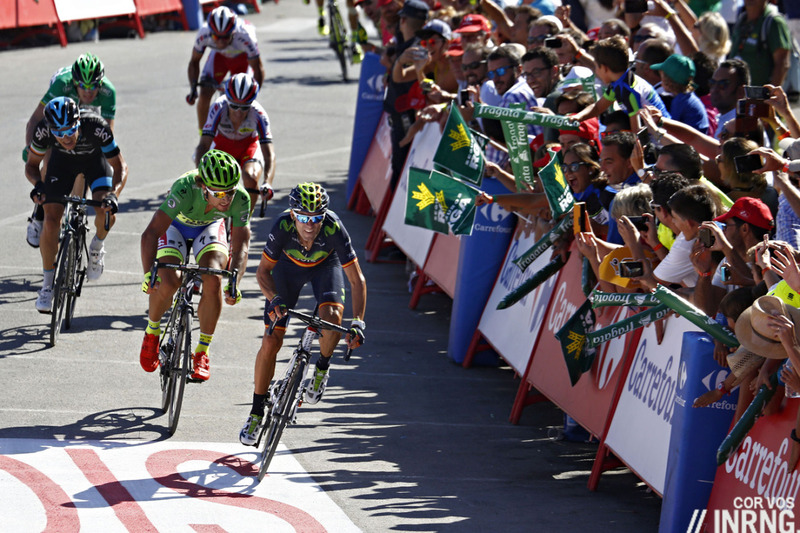 The Finish: the race runs into the town of Cazorla, first a light descent and then the road picks up. Instead of taking the main road around town it heads straight into Cazorla and this short cut means steeper roads. There’s a nasty pitch of about 9% for a kilometre and some tight bends too. It eases out of town on the road to Iruela but we’re talking 5-6%. There there’s a right hand turn with 500m to go and it climbs all the way up to the line. The Contenders: it’s not a repeat of Monday’s finish but it is similar with some climbing and steep sections as the race winds its way through the finish town so taking the riders who did well there is the obvious place to start. Alejandro Valverde has it all right now with good form, a tactical sense, a strong team, confidence and more. He’s also closing in on the red jersey and that time bonus is an added motivation too. Peter Sagan can’t be ruled out, at pixel time he’s 300-1 with one bookmaker and long odds with others too but give his performance on Monday that seems a curious price especially as today’s finish isn’t as steep nor as long. Dani Moreno and Joaquim Rodriguez have been close but both are suited to steeper, harder finishes than this. Nicolas Roche has been looking frisky and once upon a time he packed a good sprint which could be deployed rather than attacking and being reeled in where he could be up against his cousin Dan Martin he, didn’t feature in Vejer the other day but if luck’s on his side then he should. There’s the chance a breakaway sticks too with half the field over 15 minutes down on GC but picking a winner here is a lottery, spin the startlist wheel and take your pick. Weather: warm and sunny with top temperatures of 33°C. The heat doesn’t make it easy but it’s not infernal and riders have had a week in the region to acclimatise so far. TV: with the finish forecast for 5.40pm Eurotime tune in by 5.00pm to watch the tension rise on the run in to the finish. It’s on Eurosport and you can rely on Cyclingfans and steephill.tv for links to feeds and streams. Daily Díaz: this stage starts in Córdoba, capital city of the ancient Caliphate, and finishes in the Sierras de Cazorla, Segura y Las Villas Natural Park. This protected area, the largest in Spain, is a great place to observe the Iberian fauna: the Spanish ibex and fallow deers are easy to spot, if you’re patient and not too noisy. The wild boars aren’t shy, and some will get very close to you in hope of some free food. Let me insist: this is one of the best places to enjoy the Iberian Mediterranean wildlife. These mountains serve also as water divide between the rivers which flow to the Atlantic (such as the Guadalquivir) or to the Mediterranean (such as the Segura). See this video to get a feel of the landscape. For me that was the most impressive win of the year. Young kid coming in with all the hype and delivers against class opposition. Chapeau. Two word answer I think – Matt White. I actually highly doubt that. Matt White is a long way from a household name in Australia, and if you wanted to talk about teams with one or more DS who was a doper when riding, well it’s a very long list, and Orica isn’t the only WT team to struggle for sponsors. Possibly a more realistic reason is the time difference to Australia. Most races usually finish from around 11pm to 2am Australian time (equating from about 2 to 5pm European time), so the audience watching is loyal but small. Australian companies probably figure they’ll get more eyeballs sponsoring one or more of the football codes. Also, since OGE have one of those Rhiis/Tinkov style sugar daddies in Gerry Ryan, there is less pressure to find a second name sponsor. Ryan still wants a 2nd name sponsor. He might be one of the richest people in OZ, but its still his money being spent. Exactly that, yes although when the team was launched it was simply Greenedge and no naming rights sponsor at all. They could find a European second sponsor no? Or an Australian one looking for European exposure? No one seems to be beating down the door. And they’ve had a good number of GT stage wins, and stints in GT leaders’ jerseys, as well as LBL and MSR. I would imagine there aren’t a lot of companies producing/selling consumer products that want their names closely associated with Orica. While not a household name, those who know of it often don’t seem to have a positive views of the mining explosive company. (I’m mostly indifferent on the topic myself.) If they want to find a partner, they may have to find another industrial company that sees some value in supporting a pro cycling team. That limits options, and further limiting things is that the rest of the world views the team as an Australian venture. Not a bad thing, but it does make for a small niche as far as potential sponsors go, especially when there are other cycling teams in the US and Europe also competing to find sponsorship. I read somewhere that the reason that they went to the Tour of Korea this year was to put their name in front of sponsors, particularly as Caleb Ewan has Korean heritage. Nothing seemed to come of it unfortunately. I think that’s the answer exactly (knowing next to nothing about the team’s efforts to find a co-sponsor) and especially since the “yournamehere” is Orwellian doublespeak. How can they possibly think “Greenedge” is an appropriate name given the title sponsor? Yes, Caleb looked mighty strong in the finish. He’s quite short especially compared to other top end sprinters. Is there a disadvantage physiologically for shorter sprinters vs. bigger longer-limbed sprinters in turning over the same big gear ratio? If so, then more cudos to the mighty mouse! Brad McGee should have woken up a proud man this morning – Caleb’s coach right through his development up until he joined OGE and also Rachel Neylan’s current coach I think, who just won Trophe d’Or (excuse spelling) overnight. Well done to all three of them. Are OGE actually looking for a second headline sponsor? I particularly ask as I think having some continuity it team names would really help the more casual observer follow the sport – I certainly couldn’t repeat, off the top of my head, all the names Europcar have gone under. I think One Pro Cycling’s decision to rider under their team name not their sponsor’s (F&F clothing) is a brave choice and one I hope works for them. Is that the Tesco F&F clothing? Quite a coup. The very same. If you are not familiar with the team its definitely worth taking a look, an interesting a refreshing take on how to built a team from scratch with genuine long term ambitions…and a great start so far. I believe Axeon Cycling are doing the same thing. Nice video on Cazorla. The best thing about Spain are its “sierras”. Great win for Ewan and good too see more youngsters taking on the established names. Maybe if you sent them some socks they could be “Orica-Inring”?